A Star PR pride ourselves on never using ‘off the shelf’ campaigns. Each of our projects is a bespoke,holistic,highly effective and targeted campaign tailored specifically for every individual client. We leverage our media relationships to build profile, influence opinion and reach the largest possible audience . We know what media want and we aggressively persue all promotional opportunities. 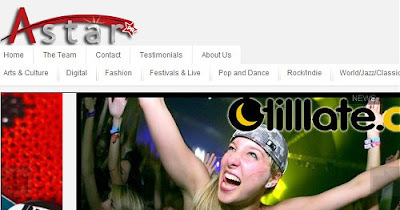 A Star PR have enviable and unrivalled contacts across all areas of the media, both nationally and internationally. If you’re looking to sell records, raise awareness of yourselves or your client and are ready to become A Star, get in touch! That copy, errors and all, comes from PR agency A Star's website. Their main business is rock acts but among their classical stable is apprentice conductor Alex Prior who has been the subject of some pretty transparent profile building and opinion influencing in the last few days. To succeed in classical music today it is not enough to be seventeen. You also need a rock star PR agency and a mother who can work the media. ... 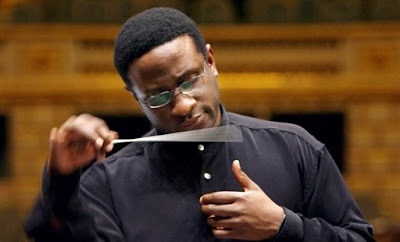 This all gives Le Balcon massively improved viability and it certainly worked its magic on the first-night audience, not least because Kwamé Ryan’s conducting of a kaleidoscope of ravishing textures was a feast for the ears. I know which conductor I will be trying to catch in concert. * Kwamé Ryan is of Trinidadian descent. From the island of Trinidad it is a short journey to Georgetown, Guyana where the Berlin Philharmonic's first black conductor, Rudolph Dunbar, was born. Read his story here. I predicted a few weeks ago that work in progress will be the next big thing. The next big thing is going to be illiteracy. Gag. Use of "holistic" is reason enough to back away. Each of our projects is ... tailored specifically for every individual client. That's a good trick. Saves time and effort, I suppose (and means the exact opposite of what the "writer" is trying to say). It's not illiteracy. That can be overcome; I'm not sure that this sludge can be. How right you are Scott. It is a very sad that this sort of nonsense is being propagated. It is even sadder that some so-called music journalists are swallowing it. The list of classical musicians represented by A Star PR makes a useful caveat emptor guide. To commemorate 30 years since the death of the legendary Elvis Presley, Warner Classics and Jazz have released Symphonic Elvis, a collection of Elvis’s greatest hits transformed into 12 fantastic orchestral arrangements, featuring guest performances from Elvis’s former band members. A Star PR executed a comprehensive PR campaign for this exciting release. Illiteracy is practically a professional requirement in the PR industry. Cultural illiteracy too - a major London classical music PR agency once suggested to a colleague of mine that we conclude our then-music director's final concert (a performance of Beethoven 9) with a balloon drop from the ceiling of the hall. In all seriousness. Interesting, though, that the Endellion Quartet, Sir Andrew Davis, Nicola Benedetti and "Jose Sererbrier" (sic) are also on A-Star's roster. What gives? And talking of desperation, you didn't include Nigel Kennedy in the list of A Star's clients. Here's hoping for great success by Ryan, star pr or not. "A Star PR were hired to build on the media renaissance of one of the world’s most formidable classical musicians"
"the media renaissance" Who would want to be represented by an agency that comes up with such drivel?! "you didn't include Nigel Kennedy in the list of A Star's clients." That's because Kennedy's exactly the sort of artist I'd EXPECT to find on that list. But the Endellions? And last thing I heard, Nicola Benedeti was still trying to maintain the impression, at least, of a serious career.